A sound like gunshot pierces my dream and I'm bolt upright, shaking, wide awake. I look down my body. I seem to be intact. No blood. Firstly I have to say Liz is a friend of mine. However I try really hard not to let that affect my reviews of her books and she always requests that I'm honest. So here goes. My honest opinion is that that is the best book she has ever written. I don't know how she can top this one. 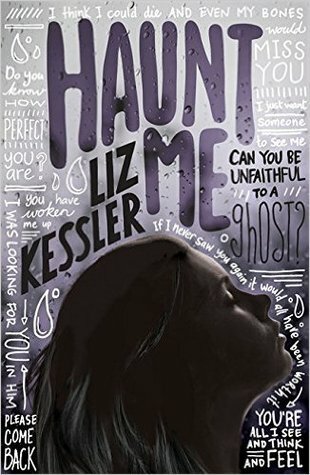 I'm not sure if it's because I love ghost stories, in fact I love anything involving ghosts and I'm convinced there is more to the spiritual world than we truly see, but this book really grabbed me. It's like a revival of the early YA books, such as Evermore, Unearthly, I Heart You, You Haunt Me and A Certain Slant of Light, which were the books that made me want to read YA in the first place. In fact it made me realise that I've lost my direction with YA, as I've moved into reading so many more contemporary when really fantasy and paranormal are my first genre loves. The book is told from three points of view. Erin, a troubled teen hoping for a new start. Jo, who doesn't realise he is dead to begin with and hides a dark secret and Olly, his brother who still struggles with Jo's death. I love how the plot unfolds and brings these characters together. At the plot moved forward, I was convinced that someone would end up with a broken heart. Once the relationship between Jo and Erin is established and Olly turns up, the story really picks up in pace and I found myself whizzing through the pages. If you think this book is just a paranormal love story, then you would be wrong. It deals with some very gritty and realistic subjects that affect many teenagers of today. From bullying to self harming and drug taking to bereavement, the book really takes you on an emotional rollercoaster. If you loved Ghost or Truly, Madly, Deeply, you will fall in love with this book too. I'm really hoping that with the release of this book, it means that paranormal YA is making a comeback.